Climate change is also a very real risk for forests and their management. 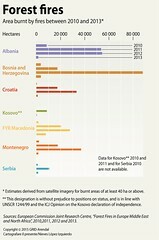 Forest fires are already a major hazard across the Balkans. A significant increase in the number and intensity of wildfires across the region has been linked to higher temperatures in summer, prolonged droughts and earlier melting of snow in the mountains (Mátyás, 2010). 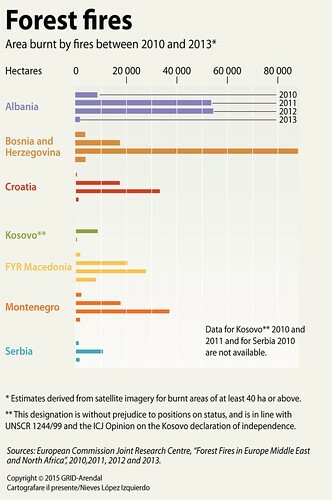 In the future, the probability of forest fires occurring, the length of the fire season, and fire frequency and severity are likely to increase in the Mediterranean (Alcamo et al., 2007). Furthermore, rising atmospheric CO2 concentration, higher temperatures, changes in precipitation, flooding, and drought duration and frequency will have significant effects on tree growth. These changes will also have associated consequences for the frequency of pest and disease outbreaks and changes in fire occurrence, and changes in wind storms and frequency – all of which will have big implications for forest ecosystems (European Commission, 2008). Mountain forest ecosystems are especially vulnerable due to a rise in the elevation of snow cover and altered river run-off regimes.